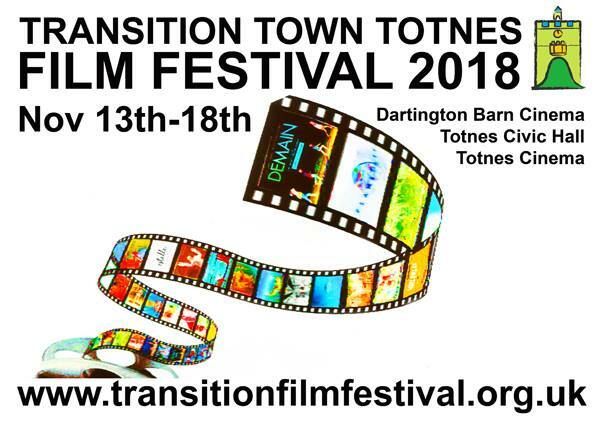 This year the Totnes Transition Film Festival is working in partnership with both the Barn Cinema in Dartington and our own local venues, Totnes Cinema and the Civic Hall. Tuesday 13th to Thursday 15th November we have 3 evening screenings at Totnes Cinema, followed by 3 full days of films – Friday 16th at Dartington Barn Cinema, and on Saturday 17th & Sunday 18th in Totnes Civic Hall. The Transition Film Festival shows films on a range of issues important to Transition – including climate change, food production, declining resources and the value of community. It also addresses key challenges of our time such as refugees, global exploitation, social exclusion/justice, and women’s empowerment. We seek to present films which provide hope, inspiration and imaginative solutions whilst not avoiding the stark realities with which we are currently faced. Unlike most film festivals we do not just show recent releases but rather present stimulating films which have not been commercially distributed. Many sessions offer time for discussions, often with the film-makers themselves and relevant speakers. There are also film-making workshops over the weekend for both children and adults. To see a full programme and for tickets please visit the Totnes Transition Film Festival website.